Looking for new ways to add a twist to your usual cupcakes? 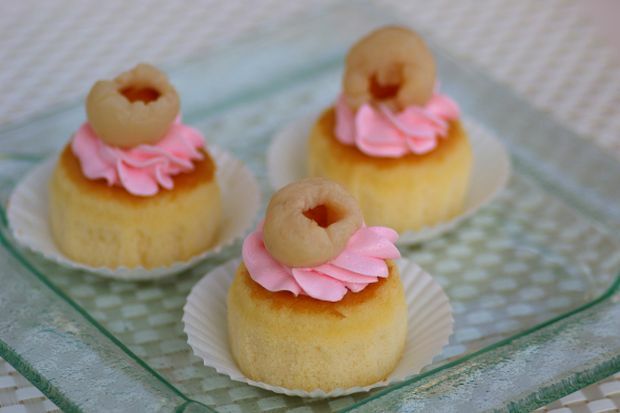 Here is the recipe for mini lychee sponge cupcake. To infuse lychee, place well-drained lychees on paper towels and pat dry thoroughly, then soak them in lychee liqueur overnight in the refrigerator. To use, drain the macerated lychees and drain well again. Keep the liqueur aside for use later. Whisk egg whites until frothy and add cream of tartar and castor sugar. Beat until stiff, then set aside. In a separate bowl whisk egg yolks and castor sugar until light and thick. Beat in canola oil followed by the infused lychee liqueur. Sift the flour and baking powder together and carefully fold into the egg yolk mixture. Then, fold egg yolk mixture into the beaten egg whites and carefully mix until well blended. Spoon batter into each paper cup cases and fill up to three quarters full. Bake for about 20 minutes or until well risen. Cool cakes on wire racks. Beat cream well, icing sugar and lychee liqueur until light and fluffy. Add a tinge of pink food colouring. Pipe a rosette on top of each cupcake and top with a piece of macerated lychee.